Small discussion class taught by a faculty member; topics chosen by instructor; may include outside activities (e.g., films, lectures, performances, readings, visits to research facilities, fieldtrips). Synthesis of writing instruction and book arts training. Takes advantage of traditional paper-based formats to develop creative expression through the written word and through book media. Care, conservation, and preservation of cultural heritage artifacts; readings, discussion, hands on sessions. An art-historical introduction to the book arts (printing, bookbinding, papermaking and paperworks, artist bookwork, lettering arts, literary fine press and fine press artist books); influences and origins, contemporary practice, and critical considerations, locating the field through the lenses of fine art, craft, and book history: weekly readings, observational analyses, hands-on exercises, and archival research in the University of Iowa Libraries Special Collections; final research, analytical, and/or critical project. Development of art work and studio practice; readings and research in contemporary theory and practice; analysis of visual language; integration of creative activities and critical thinking in student's own art practice and analysis of contemporary work in book arts; group and individual critiques, studio assignments, presentations, discussions. 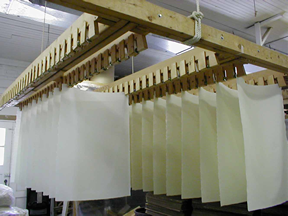 Topics in the history and technique of papermaking. Conceptual and methodological approaches to 2-D and 3-D paper works; students create a body of works that couple the unique properties of paper-pulp medium with personal visual ideas and clarity of intent; contemporary issues in paper pulp and the medium's relationship to larger art and craft contexts. History, technique, and aesthetics of traditional Islamic and Asian hand paper making. History and technique of traditional European hand papermaking and related aesthetics; students gain confidence in pursuing independent production of handmade papers or undertaking related research in their own particular areas of interest; fiber preparation, sheet forming, and drying/finishing methods; concurrent readings and discussions of related history and aesthetics; special projects selected by student with instructor approval. Advanced independent projects undertaken in a classroom setting; collaborative group discussions to plan, implement, troubleshoot, and evaluate student projects. History of Western letterforms, with focus on tools, materials, techniques; the major hands, their place in history, their influence on modern times; creation of letterforms using appropriate tools; hands-on approach with emphasis on understanding rather than mastery. Fundamental calligraphic skills using Roman majuscule, Humanistic minuscule, Italic; basic layout and color theory incorporated into letter practice. Special topics and advanced projects in calligraphy and letter arts. Introduction to letterform and typographic fundamentals; designing with type--attention to composition, hierarchy, historical practice. This course provides an overview of the history, principles, processes, and terminology in typography. The focus is on the organizational and creative aspects of designing with type, and on the development of the necessary technical skills. Introduction to Adobe Creative Suite graphic design software (InDesign, Illustrator, Photoshop); emphasis on using software for book arts applications; typesetting and pagination of multipage documents; methods for combining text and image; tools and techniques for digital illustration; creation and manipulation of digital images; preparations of digital files for desktop or letterpress printing and services bureau output. Students plan, design, and produce a book using Adobe Creative Suite; page layout software, typography, page layout and design, book formatting, handling of image files, preparation of materials for print and other contemporary book media; history of book design, book design in contemporary publishing; visit to University of Iowa Libraries Special Collections. Introduction to concepts, techniques, and technologies used to design and produce artists' books with personal computers and graphic design software. Topics such as book design, printing, paper arts, letterforms, typography. Analysis and description of physical book artifacts and their component parts (parchment, paper, bookbinding) and allied specialties (the lettering arts, printing and illustration techniques); reading, writing, presentations. Study of authors, genres, and formats, as affected by the cultural conditions of writing, printing, publishing, collecting, and reading. English majors may apply this course to the area and/or period requirement designated in the course description at MYUI. Relation of text, decoration, function, creators, and audience in different genres of medieval manuscript books 400-1500 A.D.
Western manuscripts and books 1200-1600; changes in production and distribution methods and in how texts were used, in cultural context. Theory and practice of book studies; meanings of word and image in the book format; comparative study of other media; applied study of the codex as physical artifact. English majors may apply this course to the area and/or period requirement designated in the course description at MYUI. Topics related to production, distribution, and consumption of books through history and into the future. Authorship, publishing, and reading within specific historical and cultural contexts. English majors may apply this course to the area and/or period requirement designated in the course description at MYUI. Cultural nature of reading practices in historic and contemporary contexts of reading; reading communities; dimensions of gender, age, class, religion, race, ethnicity; examples of recent scholarship; use of primary resources; seminar. Topics relevant to book studies and special collections. Advanced, 1-3 credit hour course taught occasionally, focusing on specialized topics in book studies.